Last week, I visited the Smith College Museum of Art for the first time — my loss — and it made me laugh as well as appreciate what I saw. The collection is fine — among college museums, it’s really quite good. But I came away with good feelings about it for a different reason: It’s the first museum I know that pushed the idea of art down to nitty-gritty details. And I mean nitty-gritty — those of you who have been there know what I’m talking about. The museum’s lower-level bathrooms were designed by artists, and I’ve never seen that before. Ok, this isn’t new (except to me) — the museum opened in its current location in 2003. And maybe it received attention at the time. But the idea is clever and shows original thinking. 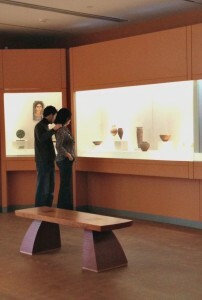 Another example of that — Smith put 12 artist-designed, handcrafted benches in the galleries (sample below left). I love that. Last year, on another visit to New England, I discovered that the New Britain Museum of American Art also used hand-crafted seating in its galleries. The curious — some were truly lovely — could have obtained a list of those artists, as I recall (in case they’d like to purchase works from them? I’m not sure) from the receptionist/information desk. At Smith, the benches merit labels just like the paintings and sculpture on view, except that they are outlined in yellow (which makes them easier to find). Ah, the artists’ names… I can’t find them at the moment. If and when I do, I’ll update this. But you get the point — what a fine idea to make visitors realize that art, real art, can be found throughout a museum. 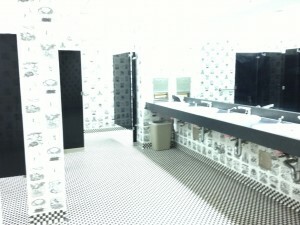 For artist-designed bathrooms, check out the John Michael Kohler Arts Center in Sheboygan, WI. Because of their relationship with the Kohler company and its artist-in-industry residency programs, all sorts of porcelain collaborations have been made possible. 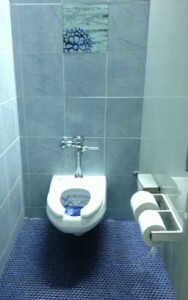 See http://www.jmkac.org under exhibitions/collections, click on washrooms. Enjoy! It’s been awhile since I have been to the Smith College Museum of Art. But what I remember is that it is the only Art Museum that I have been too that had a roughly equal amount of art by women as men shown in their collection. I would love to know of others – if anyone has noticed. (I also enjoy artistic bathrooms, etc).